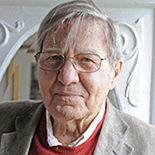 Galway Kinnell (born February 1, 1927 – October 28, 2014) is an American poet. For his 1982 Selected Poems he won the Pulitzer Prize for Poetry and split the National Book Award for Poetry with Charles Wright. From 1989 to 1993 he was poet laureate for the state of Vermont. "It is necessary to reteach ..."
"Let our scars fall in love...."
"To me, poetry is somebody s..."